Some of my favourite chapters in manga, and in shonen comedies in particular, are the ones that show the interactions of characters who don’t normally get much time together. Now while Toriko Torako has had time with Yotsuba before, it’s almost always with either Asagi or her father as well, so the atmosphere is very different now. She was always the quiet, stoic type of character, which I suspect is why there have been so few scenes of her with only one other person. You can’t really get a good dialogue going when only one person is talking. 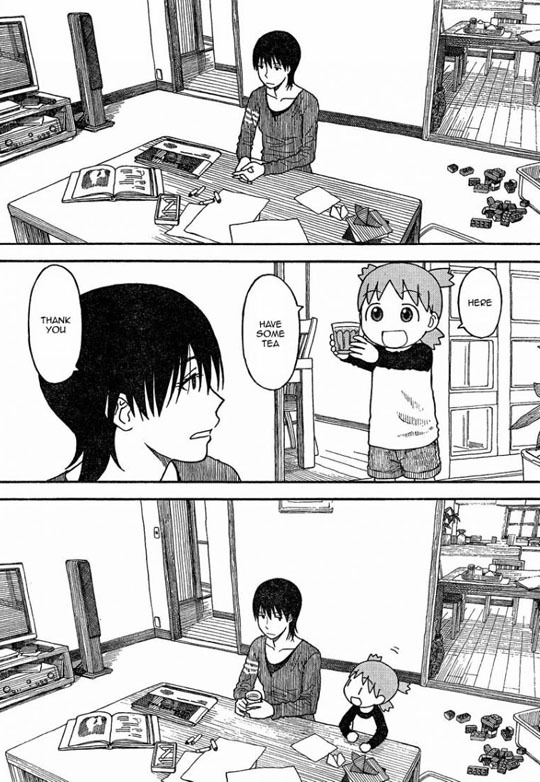 What makes this scene work is having Yotsuba herself take control of the conversation. The first half of the chapter is mainly her going over the more recent events of the series, like her camera and the incident with Duralumin. This is why it’s so good that Yotsuba&! has such a consistent timeline, since the story can call back to things like that. Most of this is done with Torako being quiet, making only the occasional observations like she’s on the phone with her parents. There’s just enough there to show that she’s listening, though, so it suits her character rather well. 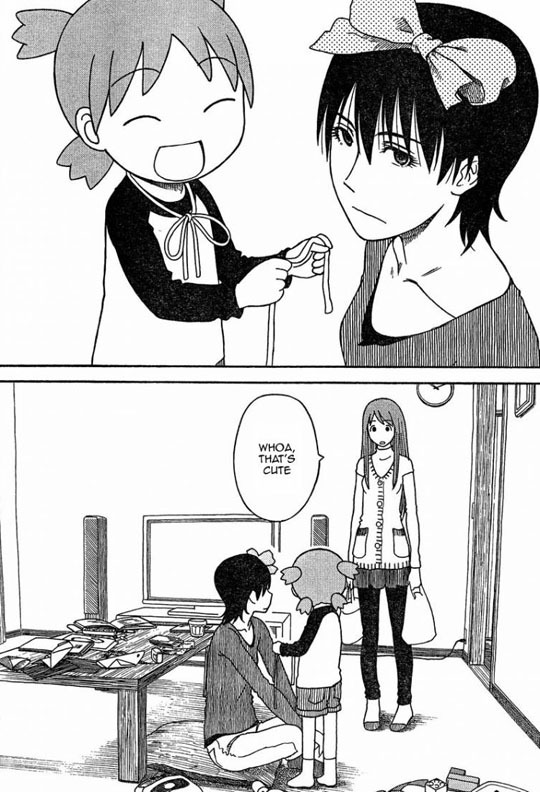 For the rest of the chapter, we get a rather charming scene of Torako teaching Yotsuba how to tie a bow for her bear. It’s a rare opportunity to see the more motherly side of a character who never gets the chance to show it. In a way, she’s acting more adult here than she does around other adults, since it takes some degree of responsibility to watch over a child like this. It also gives her the chance to get in touch with her cuter side, in more ways than one. For the longest time, I was confused about where Torako fit in with the other characters. Almost everyone else in the cast is fairly outgoing, so it’s likely that I couldn’t see as much of her character because she chose not to show it. Chapters like this are good because they develop her as a character while she gets to stay in her nice, quiet comfort zone. Posted on March 2, 2012, in Chapter Discussions, Series, Yotsuba&! and tagged comedy, manga, Torako, Yotsuba, Yotsubato. Bookmark the permalink. 7 Comments. It has been decided. There must be a Toriko Yotsuba Crossover. It would be the cutest and most action packed chapter or either series respectively. This must happen. But seriously, this was a great chapter. I knew a few people in high school that had the same personality as Torako. Funny thing is, they were always hanging around people who were alot more talkitive,active, and often times stupider then they were. So seeing Torako and Yotsuba interact in this chapter was also a kinda throw back to people i actually knew. But i almost think thats the point of alot of characters in Yotsuba. Their personalities are so diverse, they’re suppose to remind you of real people. I think I’m a bit like Torako. Quiet and always around talkative people. Somehow I never made the connection until now. I’m not sure about a Yotsubato/Toriko crossover, but I did once consider a Yotsubato/Black Lagoon crossover, where Yotsuba and Revy get into an epic water gun fight. It’d be the greatest crossover ever. I’d been waiting soooo long for a new chapter of Yotsuba and it was everything I wanted (except still too short… There’s never enough). Agreed about Torako. I’ve always really liked her character, but she rarely comes into play except as Asagi’s convenient friend. This chapter makes her so much more. Plus, she’s totally my type! I totally agree. It did feel like we were seeing a different side of her this chapter. I need to get caught up on this series. It’s good fun. It is, and you should. This looks like a pretty heartwarming manga, might try it one of these days.